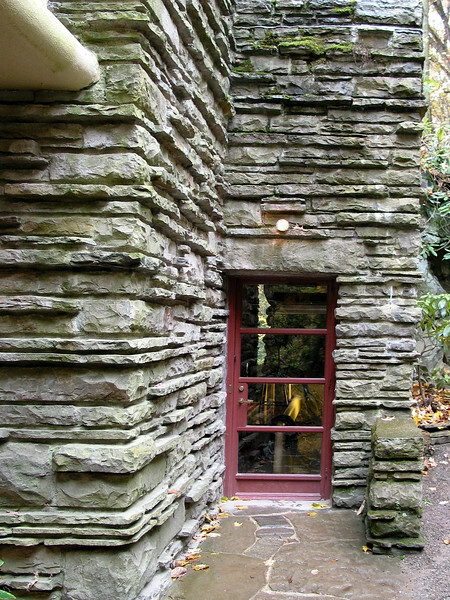 Fallingwater, in southwestern Pennsylvania, is acknowledged as one of Frank Lloyd Wright's masterpieces, and has even been called "the best all-time work of American architecture." It's perhaps the most famous private residence in the country, if not the world, at least from an architectural perspective. It was designed in 1935 as a vacation home for Edgar J. Kaufman, who owned a department store in Pittsburgh, about a two hour drive away. It is built over a natural waterfall on the Bear Run creek. The house manages to be both stunningly bold and modern, yet very much integrated into the landscape, being built right into and over the boulders of the bank. I saw it on a cold and drizzly Fall day, but with wonderful leaf colors. The metalwork had just been restored, and substantial reinforcement had been done to the astonishing cantilevered terraces, which had drooped significantly over the years. There was still some scaffolding left, but the structure and details of the house shown through. A rear door, showing the metalwork in Wright's favorite "Cherokee Red"